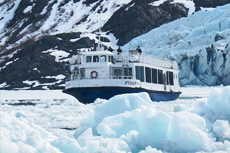 Relive the ice age as you cruise across Portage Lake to witness a mighty, and breathtaking, Alaskan glacier. Rained while we were in Portage, but got some close ups of the glacier. cruise to Portage Glacier. Very good view of the glacier. Blessed with clear weather. Driver provided good commentary on trip to Glacier cruise. Park ranger provided good talk on our boat to the glacier. Unfortunate that it rained all day, so we were not able to see 26 glaciers. Unfortunate that it rained all day, so we were not able to see 26 glaciers. But captain opted for quality, and took us to two wonderful glaciers where we spent quite a bit of time and were able to see one calving. $199 for 8 hour tour. $199 for 8 hour tour. Lunch was poor. Just soup, roll and pastry bun. I loved the conservation center and the animals and the boat to glacier even though cold wet and rainy.